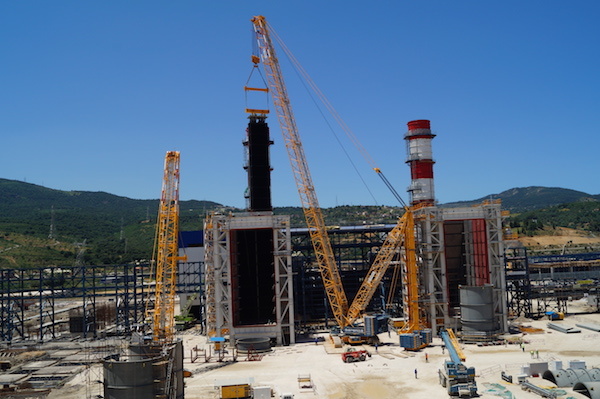 Sarens has mobilized a 10-member crew and two crawler cranes to perform a series of forty lifts at the Bellara gas power plant in Jijel, Algeria on behalf of its client Hyundai Engineering. At the beginning of the mission, Sarens used a modular trailer to transport modules from storage to the lift area. Today, the crew is on its way to completing the full series of lifts, which include 118t-203t power plant modules lifted at 22.5-30 m. The equipment for this operation, that took three days to set up, includes CC2800-1 crawler crane (600t) in SSL configuration and with 84-metre main boom, CC2400-1 crawler crane (400t) in SH configuration and with 42-metre main boom, K25 modular trailer with 12 axles and one mobile crane. One of the main challenges for the Sarens crew was the new procedure the client was using to detach modules from the stand-up jig, which creates a mere 6mm distance between the module and casing. “This method consists of extracting the module with one crane only, by fixing the ‘stand-up jig’ to the metal structure of the casing during the lift,” explained the engineering manager Yassine Amrouche. To do it, the team first performed a tandem lift, and then made a rotation up to a point where they can detach the module from the frame, rotate it again and put it into its final position. The Sarens crew has completed twenty lifts and now is preparing for the next 20 modules to be installed soon. Bellara is a 1.400MW gas powered plant and a key part of the larger Algerian and Qatari Bellara steel complex project. Algeria’s Sonelgaz has began the construction of this $800 million-dollar facility in 2013 and it should be fully operational by the end of this year. Previous PostPrevious Launch of the new “Quintero One” capsule of Hyperloop !